The New Jersey Business & Industry Association said today it is eager to work with the Legislature’s new bipartisan Manufacturing Caucus to put a spotlight on the challenges facing manufacturers in the state and explore solutions that will grow this sector of New Jersey’s economy. Senate President Steve Sweeney (center) at a news conference today announcing the Legislature’s new bipartisan Manufacturing Caucus. NJBIA Chief Government Affairs Officer Melanie Willoughby is at right. 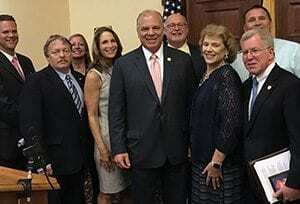 “The legislative Manufacturing Caucus is an idea that NJBIA has long-advocated, and we look forward to working with Senator Bob Gordon and the members of the panel as they bring renewed attention to issues faced by this $44.5 billion New Jersey industry that employs more than 240,000 workers,” said NJBIA President & CEO Michele Siekerka. Legislative leaders held a Statehouse news conference today to announce the creation of the Manufacturing Caucus as well as other job-training initiatives, including a proposed November 2018 bond referendum to provide increased funding for vocational education. NJBIA Chief Government Affairs Officer Melanie Willoughby spoke about the importance of providing more funds for career and technical high schools so that more students have the opportunity to acquire the skills that lead to well-paying middle-class jobs. Manufacturers report they cannot fill many of these high-tech jobs because of a lack of qualified applicants. Siekerka noted the majority of New Jersey manufacturers today are smaller businesses using advanced high-tech manufacturing processes. These companies require highly skilled workers capable of running complex software and modern cutting-edge equipment. Workers need to have advanced training and industry credentials, but not necessarily a four-year bachelor’s degree. “Our member companies have told us they often have difficulty filling these advanced manufacturing positions, even though they pay good middle-class wages averaging $90,540 a year,” Siekerka said. Siekerka said 82 percent of the manufacturing GDP in New Jersey is derived from advanced manufacturing industries, which includes food preparation and packaging, chemicals and pharmaceuticals, machinery, fabricated metal, and computers and electronics. According to NJMEP, every $1 spent on manufacturing adds another $1.81 to the state’s economy, the highest multiplier effect of any economic sector, she said.